Bengaluru-based EssCee Enterprises was established by BV Shashidhar and KR Chandrashekar in 1999. The journey started with one lamination machine to cater to the printers in Bengaluru. In 2003, the company bought its first printing machine, a used 2-color Heidelberg, which started EssCee’s journey as a mainstream printer in the city. Over the years, EssCee kept adding more finishing equipment in its first printing and packaging plant located in Rajajinagar Industrial Town. The partners added finishing equipment for diecutting and pasting folding cartons, following which they realized the need for a bigger working space and opted for a 60,000 square feet space in Bengaluru’s Peenya Industrial Town. EssCee Enterprises specializes in the supply of cartons, books, catalogs, leaflets, brochures, calendars, visual aids, paper carry bags, posters, danglers, labels, writing pads, and many other printing requirements of the industry. It is an integrated offset commercial printer and converter of cartons. We met Shashidhar and Chandrashekar at their Peenya unit and were awestruck to witness the design aesthetics and cleanliness of the unit. Chandrashekar gave us a tour of the plant, which was nothing short of a visual delight. The company has a vast range of equipment to cater to all types of sophisticated printing and packaging. The printing machines include a brand new RMGT 790 6-color plus coater that was installed at the plant in February 2017. Although the new press is UV-ready, it has been quite loaded with work since installation and it may require a breathing spell when the partners decide to actually upgrade it with the UV cassettes. The plant also has a used Heidelberg 5-color with coater, a used Mitsubishi 4-color press and three used Bobst diecutters (a Bobst SP 104-E and two Bobst SP 102 E autoplaten diecutters). In addition there are two Heidelberg foiling machines, a Proteck cutting machine, two Robocut cutting machines, a bookbinding machine from Muller Martini, a board to board pasting machine, Screen CtP machine, a Horizon perfect binding machine, a Shoei Star paper folding machine, a stitching machine, a window patching machine, etc. 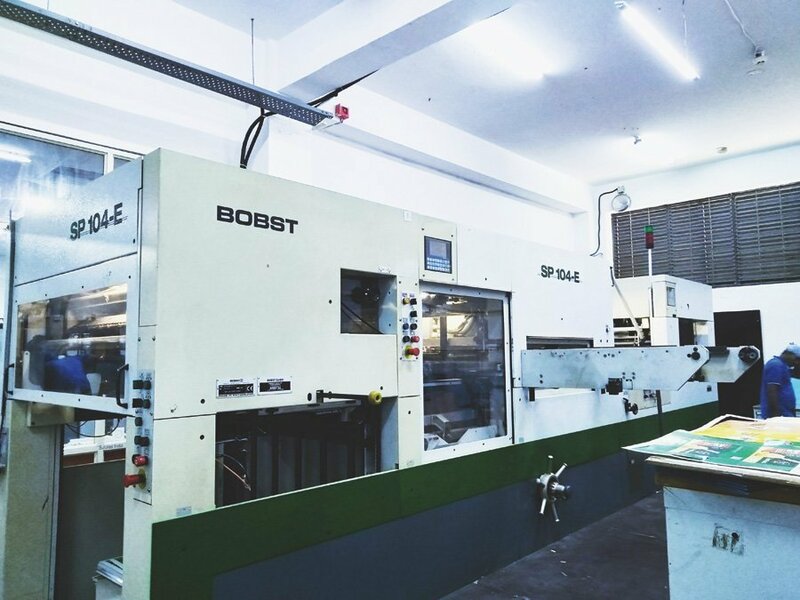 In November, EssCee booked a Bobst Ambition folder-gluer, which will be installed at its Peenya unit in the coming month. In addition, the company also plans to install an inspection machine and is considering some options for the same. “Our relentless ambition, foresight and policy to sustain a competitive edge in the world of printing at all times, has helped us grow at par with the printing industry as a whole. 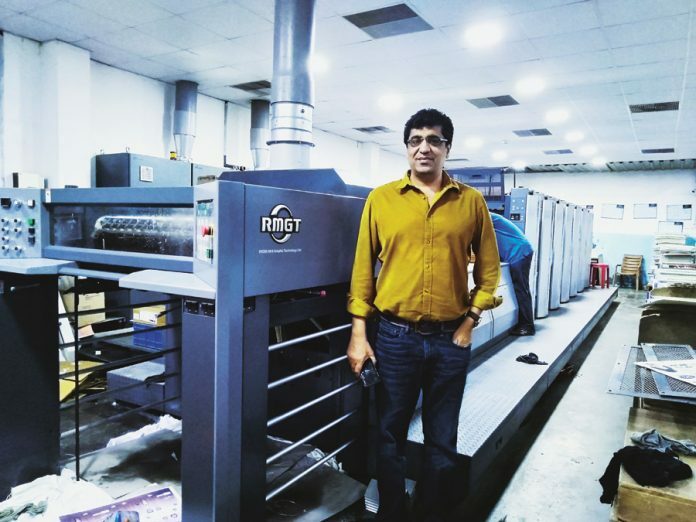 In order to bolster our capacity, we keep adding newer machines and today we have a complete in-house infrastructure to practically meet any printing and packaging requirement,” says Chandrashekar. “We cater to high-quality printing requirements of our customers worldwide. Our company offers a one-stop fully integrated solution in printing and packaging with focus on quality and customer satisfaction. This has helped us to build and strengthen our customer relationships,” adds Shashidhar. Equipped with the most advanced facilities and having a penchant for state-of-the-art technology, the partners have developed the capacity to handle any job work in printing and its allied processes. “We have customers coming to us with their specific requirements and we have the know-how to cater to their customized needs with different styles of packaging. This has not only helped us to build our customer base but also stand tall in the face of tough competition,” shares Chandrashekar. EssCee currently has a workforce of 200 people, who are periodically trained to stay abreast with latest technology. Chandrashekar and Shashidhar soon plan to add another 30,000 square feet to the existing facilities and also increase the work force to 300 employees within the next year. An ISO 9001:2008 certified company, periodical audits are conducted at each of EssCee’s facilities to check quality objectives like waste reduction through strategic planning resulting in lower manufacturing costs, employing emerging technologies to achieve superior production, while frequent training and updating motivates the work force to produce world-class products. The company has a total conversion capacity of about 300 tons of board each month and an output capacity of 12,00,000 cartons a day. What is the.contribution of printing industry towards SUSTAINABILITY? Raw mtrl. Suppliers play a greater role.? Or is it a combined activity ?